Investigation of the clinical, serological and genetic factors that determine primary non-response, loss of response and adverse drug reactions to anti-TNF drugs in patients with active luminal Crohn’s disease. 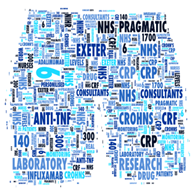 Personalised anti-TNF therapy in Crohn’s disease is a 3 year prospective uncontrolled cohort study investigating primary non-response (PNR), loss of response (LOR) and adverse drug reactions (ADRs) to Infliximab (IFX) and Adalimumab (ADA) in patients with severe active luminal Crohn’s disease. The primary objective of this study is to investigate the mechanisms that underlie PNR, LOR and ADRs. To develop a cost-effective, individualised anti-TNF treatment strategy for patients with Crohn’s disease which maximizes benefit and minimises harm. To report the initial UK experience of Biosimilar Infliximab (RemsimaTM and InflectraTM) including efficacy, safety and pharmacokinetics using a prospective open labelled study design. This study builds on the achievements of the UK and international IBDGC in identifying IBD susceptibility genes. These discoveries have provided important insights into disease pathogenesis but are not expected to have an impact in the clinic for a number of years. This study aims to take genetics and biomarker discovery into the IBD clinic to address questions of immediate clinical importance. Patients, starting anti-TNF therapy for the first time will be invited to participate by their gastroenterologist. Routine research visits are scheduled for weeks 0, 12, 14, 30 and 54, and additional visits scheduled if LOR occurs or the drug is stopped. For patients receiving IFX additional short visits are scheduled prior to infusions at week 2, 6, 22, 38, 46. To minimise inconvenience to patients all visits will be scheduled to coincide with routine outpatient or infusion clinic appointments. At week 54 patients are invited to enter the extension study and followed every 6 months for 2 years. NB. Recruitment into this study ended in July 2016 and it is now in its follow-up phase. This observational study is funded by CORE, the British Society of Gastroenterology research charity and by unrestricted educational grants from Merck Sharp & Dohme (MSD), AbbVie, NAPP, Pfizer and Celltrion. The sponsor of the study is the Royal Devon and Exeter NHS Foundation Trust.